This walk: 2015-2-11. RAF Harrowbeer, Roborough Rock, Allan Williams turret, drinking fountain, Queen Victoria Diamond Jubilee monument, Devonport Leat, Plymouth Leat, Sheepstor, kissing gates, Elford Town Farm, Yeoland Consols Mine, Sir Thomas Tyrwhitt's horse-drawn tramway. Previous walk in this area: 28th November 2012. A partially overlapping walk from Clearbrook - 8th December 2010. Most photographs on this page were taken during a 'recce' on 26th January. Zoomable 1888-1913 6-inch O.S. seamless map of England & Wales. The tea rooms and restaurant - the white building was the wartime Watch Tower. Roborough Rock - the 'dry' one as opposed to The Rock Inn, Yelverton. Also known as Udal Tor, Ullestor and Hurlestone Rock (1765). Attention, class, Miss is speaking! There seems to be an airlock - on twisting the knob, there is a little pressure escape but no water! Nothing wrong with that prostate! Glenfield & Kennedy Ltd, Kilmarnock (on the Grace's Guide - British Industrial History web site), Glenfield & Kennedy (on the Future Museum web site), Glenfield Valves Ltd (the modern company, part of a conglomerate. "Victoria Regina 1837-1897" - she reigned 20 June 1837 - 22 January 1901 (63 years 7 months, she died aged 81). "The material that I have to work with ............"
This photograph shows the Devonport Leat and, across the road and behind the tree trunks - in front of the greenery, Plymouth Leat - built by Sir Francis Drake in 1591 ..... the road (also the cycle track) is built over the old horse-drawn tramway built by Sir ThomasTyrhitt, this was the old Plymouth & Dartmoor Railway, opened in 1823. Two stones and earth that form a sluice in Devonport Leat: the purpose of this is to promote drainage into Plymouth Leat. The drained water (rain run-off) ends up going into the old Crymes Leat (known to today's Commoners as Clearbrook Leat) and then runs downhill to the River Meavy and thence into the River Plym at Shaugh Bridge. Showing Devonport Leat right alongside the local access road (the former tramway). Habitat piles left by the Dartmoor Preservation Association Conservation Team after they cleared Devonport Leat. Another view of the road ahead. This walk takes the path towards Hoo Meavy. Elford Town Cottage - "Elford Town" was the local area, the name of which became corrupted later to "Yelverton" - ostensibly when the railway was built and a name was needed for the station. Epiphytic Common Polypody (Polypodium vulgare) growing on an overhead branch. Last time we were here there were Gloucester Old Spot pigs to see. Railway bridge (GWR to Princetown), at SX 5210 6701. A kissing gate, where the post and struts are made from bent railway rails. Having discovered the origin of the "kissing" aspect, I am disappointed, no need to "pucker up" ever again! The etymology of the name is that the gate merely touches ("kisses") the enclosure on either side, rather than needing to be securely latched - and I thought it was all to do with good old fashioned philematology! Close-up of the old, rusty rails. The old railway bed, alongside the footpath. Leaning over a fence, there seems to be an old lane here. General view - railway on ther left, lane on the right. Close-up of a moss, looking like a frond of bracken. Closer still, through the wire mesh. Another view of the old mine building. Another sign, no doubt made by the farmer. View from the other end, looking downhill. Beside the tunnel, the stile. View uphill from near the stile. 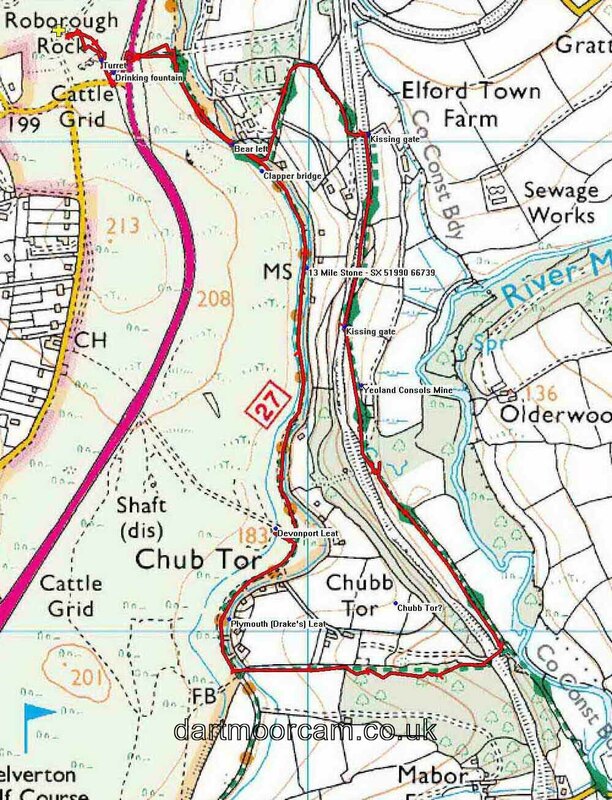 There it is - Chubb Tor! View through the woods after the stile. Unusual "tidemark" of wind-blown leaves - the rest of the field was clear of leaves. Drinking trough with a "step-up" for shorter-legged animals. The embankment of Devonport Leat where it crosses the Yelverton golf course. Another view of Devonport Leat on the golf course. Beside the road, and slightly lower, Plymouth Leat. A piece of iron rail, all that remains of Sir Thomas Tyrwhitt's horse-drawn tramway (opened 1823), this tramway being the beginnings of the Plymouth & Dartmoor Railway which became a steam railway. The original tramway ran from Crabtree (then extended to Sutton Pool) to Princetown, with various branch lines added later. The granite setts have two holes for fastening the rails. This walk was reached by turning of the Roborough-Yelverton A386 road at the Crapstone turn-off, taking the first turning on the right and parking in one of the old aircraft bays on the old WW2 airfield, marked by the yellow cross on the map. Distance - 4.91 km / 3.05 miles.